With the explosion of uninspired e-mail solicitations, dull fundraising dinners, and cookie-cutter direct mail campaigns, donors are demanding a new, personalized approach when being asked for money. Drawing on the authors‘ practical experience and the most current psychological and neurological research, The Influential Fundraiser offers a wealth of approaches that will help fundraisers make significant and successful creative „asks“ for money from donors . . . in person. 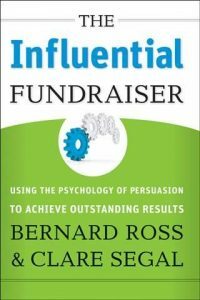 Written by Bernard Ross and Clare Segal—two leading experts in the field of international nonprofit fundraising—the book offers step-by-step guidance for gaining confidence and learning the necessary skills and techniques fundraisers must have to build successful relationships and raise substantial amounts of money. The Influential Fundraiser is international in scope and includes helpful suggestions for dealing with a wide range of cultural and diversity issues. In addition, the book explores the importance of influence more generally and offers techniques for persuading your board to invest in your ideas, engage a powerful advocate to speak for your cause, and motivate teammates when their confidence is low. With this toolbox of different approaches, any nonprofit professional can be transformed into an influential fundraiser.